There are a lot of different options when trying to find the best deals on kayaks. Whether you’re looking for a tandem, inflatable, single, or sit it, you’ve come to the right place. We researched the most populated brands and top-rated models to put together these Kayak reviews. Before we get into our top picks, let’s take a closer look at some of the features that you need to know about when choosing the best kayak for you. Type: There are a few different types that made it to our list. You’ll find some inflatable kayaks, sit in, sit on, tandem, single user, even youth! Basically, there’s something here for everyone, no matter what you’re looking for. 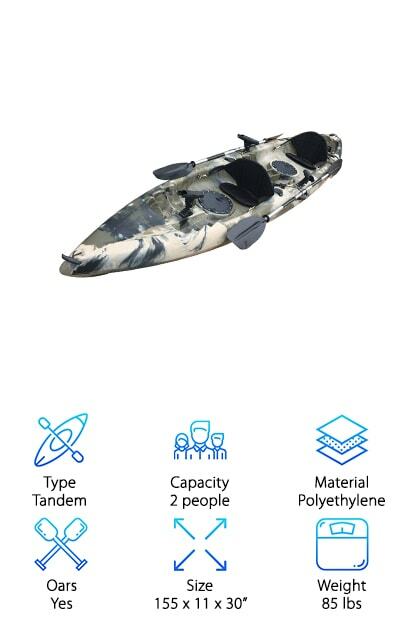 Capacity: This will give you an idea about how many people the kayak can hold. Some of the 2 seaters can also hold a small child or large dog. You should also keep the weight limit of each kayak in mind, too. Material: The type of kayak you’re interested in buying will determine the material that it’s made of. 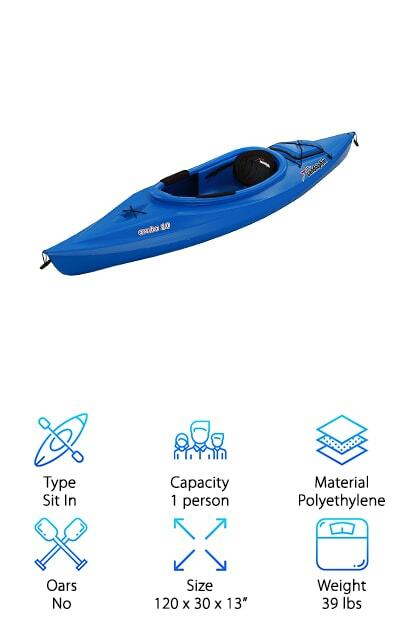 Obviously, a sit-on inflatable kayak isn’t going to be made of the same material as a hard plastic kayak that you sit in. Oars: Some of these kayaks come with oars, some do not. Oars are definitely necessary to use a kayak in water. Factor in whether you’ll have to buy your own oars when figuring out how much kayak you can afford. 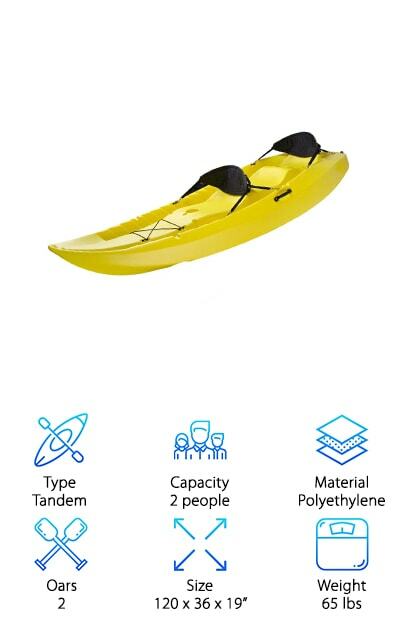 Size: Kayaks that were designed for one person are typically smaller than those made to hold 2 or more. Also, inflatable kayaks tend to be on the smaller side. Kayaks really come in all shapes and sizes. Weight: Remember that you will have to transport the kayak from storage to your car to the water. 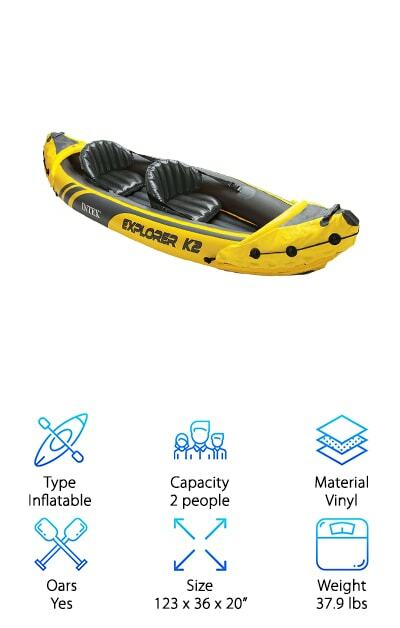 If you don’t have a large vehicle or a lot of storage space, an inflatable kayak might be just what you’re looking for. Now that we covered some of the things you need to know about kayaks, let’s take a look at our list of the top ten best kayaks for sale. If you’re in a hurry, start with our top pick and best pick. They’re easy to find because they’re the first 2 items on our list! After that, stick around if you can to learn more about the quality products that round out our top ten. All right, ready? Let’s get started! This inflatable Sevlor Quickpak Kayak is one the best kayaks around. One of the things we love about it is it comes with a pump so you can quickly get it ready for the water. How quickly? Believe it or not, in about 5 minutes. The valve system has a double lock to make it easy to inflate and deflate. This is a really durable kayak. The 21-gauge PVC construction combined with the tarpaulin bottom protect it from punctures. But, if you do have a problem, the multiple air chamber system lets the other chambers keep you afloat. Something we thought was really cool about this one is that the backpack actually converts into the seat. That means there’s one less thing to carry. It fits one person and gear up to 400 pounds. 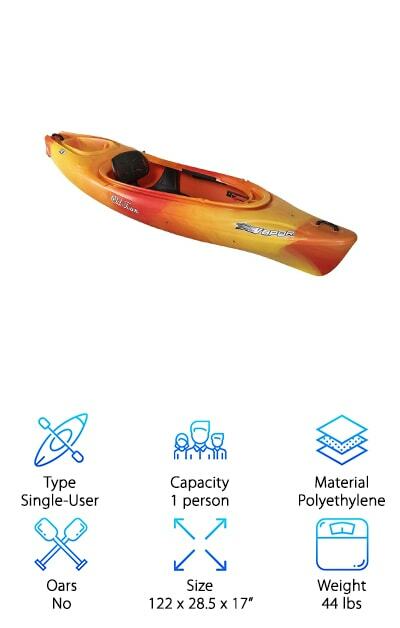 Not only is the Intex Explorer K2 Kayak our budget pick; it’s also one of the most top rated kayaks around. It’s made for smaller bodies of water, like lakes and rivers that don’t have rapids. The sturdy, streamlined design is comfortable for everyone and is a great way for 2 people to explore the water together. There are 2 adjustable, inflatable seats that have backrests to give you a bit of extra support. Paddling is easy thanks to the streamlined shape. We also love the bright yellow color. On the off chance there's an emergency, the bright color will definitely help you be noticed. It’s inflatable, too, which means it’s easy to transport and store. Don’t worry, it inflates and deflates quickly, too, and a pump is also included. 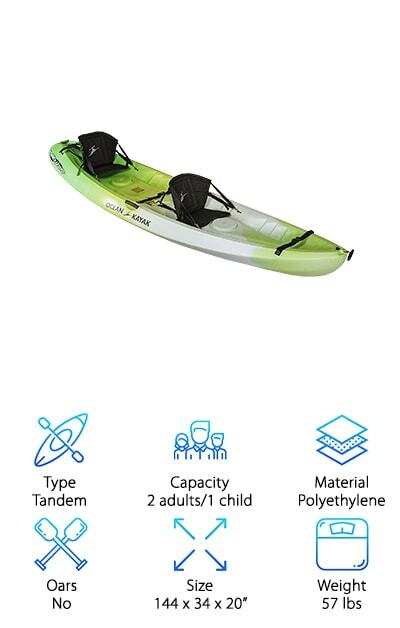 For anyone with a child in their life who’s ready to get started kayaking, this Lifetime Youth Wave is one of the best kayaks for beginners. It’s ideal for kids ages 5 and up and can hold up to 130 pounds. What makes it great for beginners or children? One of the things is the wide stance which makes it really stable in the water. Another cool thing is it’s designed so that it’s really easy to get back on it from the water. The back of it is sloped and it even has swim up steps to make it really simple. There are a few different footrest positions, too, so kids can figure out the position that they’re most comfortable with and it gives them a little room to grow with the kayak. This tandem kayak from Lifetime has a 500-pound capacity. The seats are pretty great because they include 2 soft backrests. Something we really liked about this one was the shape of the hull. It’s a tunnel hull, which gives this kayak a really great stability and maneuverability. It’s also nearly impossible to tip over which makes it really safe. This would be a great choice for someone who’s just starting out because it’s so reliable. 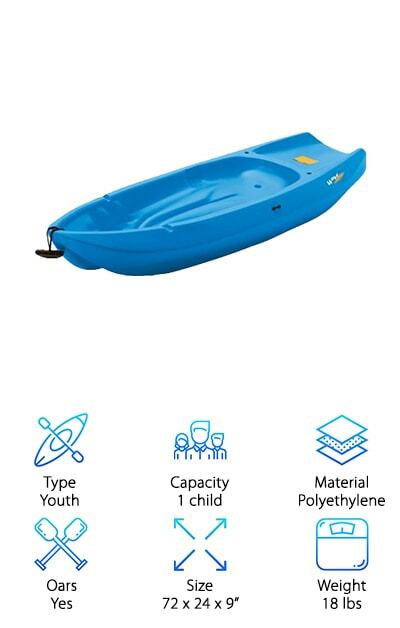 Or, if you have a little kid in your life who wants to join you on your next kayak adventure, this could be the perfect one for you. Guess what else? It’s also well equipped for fishing with a rod holder, plenty of storage, and even a mast receiver so you can add a sail. 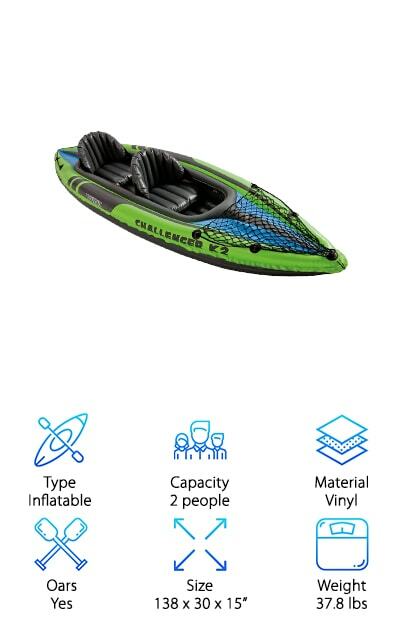 The Intex Challenger Kayak is a 2-person inflatable option that’s one of the best river kayaks we researched. It has a sporty design and is easy to paddle, which makes it great for exploring mild rivers. We love that it comes with a pump. That just makes everything so much more convenient because there’s nothing that you need to buy before you can use it. This is one tough kayak, too, made out of super tough vinyl that’s UV resistant and really difficult to puncture. There are inflatable seats and backrests plus an inflatable floor that provide some additional comfort and a lot of stability to the cockpit. As for storage, there’s a cargo net to stash your supplies. Plus, to make it easy to carry, there’s a grab line on each end. This is one of the top rated fishing kayaks primarily because it was designed for fishing. What makes it so special? It is literally loaded with features that make it perfect for fishing. First of all, it has 7 fishing rod holders in total. 4 of them are securely mounted and 3 of them are adjustable. There are also various storage areas, including a waterproof compartment where you can stash your wallet, keys, or smartphone while you’re fishing. And when you need both hands on your fishing rod, the paddle parks hold on so you don’t lose them downstream. In addition to being one of the best kayaks for fishing, this is also one of the best tandem kayaks we came across. Plus, it can hold plenty of weight - up to 450 pounds! One of the best kayaks to buy for solo adventures is this Old Town Recreational Kayak. It’s worth taking a closer look. It’s great for lakes, ponds, and mild rivers thanks to the strong polyethylene construction. It’s really comfortable, too. The padded seat is adjustable plus there’s padding for your knees and thighs in the cockpit. Plus, there’s a molded in tray that even includes a cup holder so you can really relax when you’re out on the water. There’s also the Glide Track foot brace system to help get a good position for control. This compact kayak still manages to be really roomy and the large cockpit makes you feel safe, secure, and in control. It’s available in 2 colors: bright yellow and orange sunrise and blue and white cloud. One of the best kayaks for ocean use, this tandem from Perception Pescador is made to hold 2 people without sacrificing its performance. It’s so stable that it’s also one of the good fishing kayaks we researched. One reason is its 500-pound capacity. That’s more than enough to support 2 people and a bunch of gear. It also has a handy recess where rods and other fishing equipment can easily be mounted. This is a kayak with a lot of high-end features and a lot of them are aimed at keeping you as comfortable as possible. Get this. It has ergonomic seating with thick cushioned padding and reclining backs. Plus, it’s made wide so it’s really stable but still able to maneuver smoothly and quickly through the water. 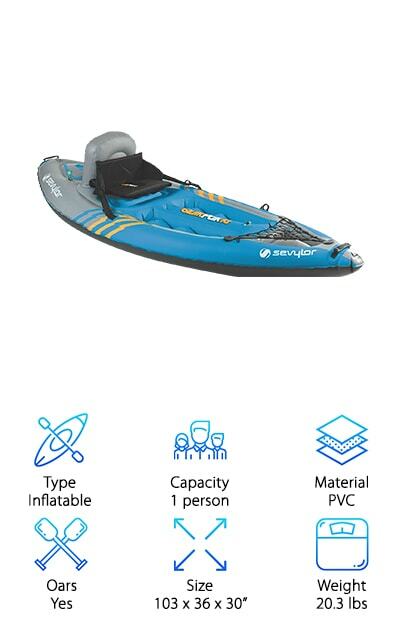 This Sun Dolphin Aruba Kayak is one of the best kayaks for camping. Why? The carrying handles make it easy to take from the water to your campsite. Plus, it’s made of high-density polyethylene. This kayak will resist UV damage so it’s a good choice to use on a weekend away with almost constant sun exposure. It’s also really easy to clean so no need to worry about it getting dirty if you have bad weather. The cockpit is open with a high back support, adjustable padded seat, adjustable foot braces, and protective thigh handles. You can make small adjustments to customize it for you. There’s also a storage hatch and bungees on the front and back to carry along supplies. One more thing: a water bottle holder in case you get thirsty. 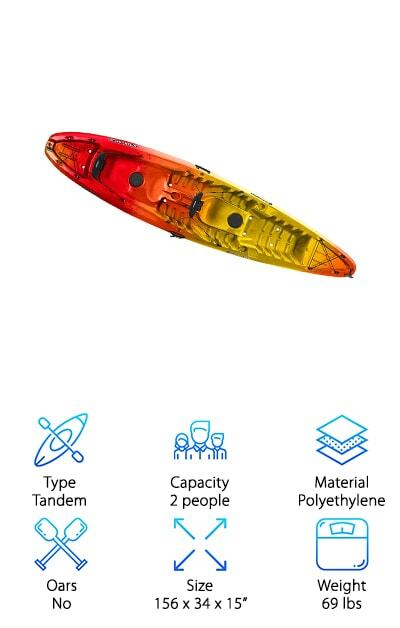 If you’re looking for best kayaks for women or families, the Ocean Kayak Tandem might be for you. Why do we say that? Because it can accommodate 2 adults and a child or pet. This is a great way for parents to get active with their children, young or old! There are 3 different seating positions and this one can actually be used as a 1-, 2-, or 3-seater and holds up to 425 pounds. The footwells overlap so whoever is sitting in the center has comfortable legroom and foot bracing. There a lot of cool features on the kayak that make it really convenient to use, too. What do we mean? It has carry handles on the bow and stern, straps to hold onto your gear, and a skid plate.